I’ve just finished watching the second season of Parks and Recreation, and I’m feeling pretty deflated. On the plus side: Amy Poehler remains reliably hilarious (and adorable) as ‘Leslie Knope’, who could well be one of my favourite sitcom characters of all time, simply because of her pep and public spirit… and she did have some really great episodes this season, attempting to raise the intellectual bar at a beauty pageant, marrying a pair of gay penguins, and hosting a late-night telethon after spending the previous night embroidering customised T-shirts for the occasion (the scene where she sits up suddenly while sleeping it off the next day is one of the funniest things I’ve seen on this show so far). I also think her friendship with ‘Ann’ (Rashida Jones) was incredibly sweet, and it really brought out the best in both their characters. I was glad to see ‘April’ (Aubrey Plaza) get promoted from intern to assistant, and consequently score more screen-time, if only because she gives the best reaction-shots of any character. The tentative flirtation between her and ‘Andy’ (Chris Pratt) wasn’t exactly on a par with ‘Pam & Jim’ in the early seasons of The Office, but they did make a darn cute couple, and I found myself investing a lot in the back and forth of their budding relationship. 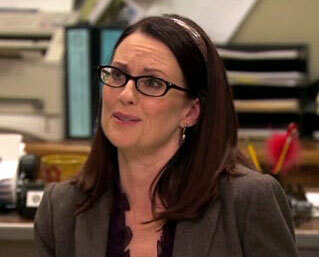 I also really loved Megan Mullally’s cameo as ‘Tammy Swanson’ (ep. #2.8), Leslie’s fiendish arch-nemesis from the Libraries department… and Natalie Morales was a great late addition as ‘Lucy’, the droll bartender who catches Tom’s fancy (ep. #2.23). On the minus side: Gah!!! Where to start? I was disappointed to see the writers shy away from the “Pit vs. Park” plot, simply because they couldn’t be bothered with it any more. I thought the constant, unprovoked bullying of ‘Jerry’, the office “whipping boy”, was painfully unfunny and made all the other characters (even Leslie!) look like total dicks. It was funny when ‘Michael’ behaved that way towards ‘Toby’ in The Office (U.S.), because it was clearly presented as a ridiculous and childish grudge, resulting from Toby’s repeated pooh-poohing of his wacky capers… whereas here, everyone’s ganging up on Jerry for no good reason, and the writers are condoning it. Feh. I also had some issues with the fluctuating “reality level” of the show… some episodes seemed to be heading in a more cartoony, 30 Rock-esque direction, which jarred with the show’s supposed focus on small-town politics, and the mockumentary style (imho). I also thought they made Andy waaay too stupid to be credible as a sympathetic character. I hated him living in the pit, because that was super-creepy and kinda sad at the same time, but really warmed up to him once he started working at the town hall as a shoeshine, cheerfully playing along with Leslie’s posse… but seriously, he wrote a song for April’s B-Day, specifically about April, and he called it “November”? WTF!? That’s just… that’s not even crazy-person-logic. It’s just irritating. All it does is sacrifice the character’s plausibility for the sake of a cheap laugh. If I could slap that joke, I would. And I really don’t feel much motivation to track down any more episodes after this season’s bizarrely nihilistic finale… the town is bankrupt, the parks department has been shutdown “indefinitely”, Leslie’s dreams have been stamped into the dirt, and April & Andy are further apart than ever! It’s almost as if they were actively trying to shake off viewers with an anti-cliffhanger. GAH!!! This entry was posted in Rants about TV and tagged Amy Poehler, Ann Perkins, April Ludgate, Aubrey Plaza, Leslie Knope, Megan Mullally, Natalie Morales, Parks and Recreation, Rashida Jones, Tammy Two. Bookmark the permalink.